Maggie Cheung (record holder - won 4 awards) will attend the Golden Horse Award. She is named the spokesperson for this year's Taiwan Golden Horse Award (Late Nov-early Dec Each Year). She expects to see Tony (won 3 awards) during the Awards Ceremony. This year, the taiwan golden horse award will be held on Nov. 23, 2013. The list of nominees were announced today for the 50th Taipei Golden Horse Film Festival. There is a strong list of contenders in the category of Best Leading Actor, including Jimmy Wang (Soul), Tony Leung Chiu Wai (The Grandmaster), Nick Cheung Ka Fai (Unbeatable), Tony Leung Ka Fai (Cold War), and Lee Kang Sheng (Stray Dogs). With two 'Ka Fai's in the running, along with two 'wars' (戰) fighting against each other, it's hard to say which Ka Fai will come out on top. Or perhaps it might be Tony Leung Chiu Wai? Based on their performance so far, Nick Cheung has already won the Best Actor award at the Shanghai International Film Festival for Unbeatable, while Tony Leung Ka Fai won Best Actor at the Hong Kong Film Awards for Cold War. Wong Kar Wai's The Grandmaster currently leads with 11 nominations, including Best Feature Film, Best Director, Best Leading Actor, Best Leading Actress, Best Cinematography, Best Visual Effects, Best Art Direction, Best Makeup & Costume Design, Best Action Choreography, Best Film Editing and Best Sound Effects. Dante Lam's Unbeatable has 6 nominations in the categories of Best Leading Actor, Best Supporting Actor, Best Supporting Actress, Best Action Choreography, Best Film Editing and Best Sound Effects. The awards ceremony will take place November 23 in Taipei at the Sun Yat-sen Memorial Hall. The full list of nominees can be view from the official website. Congratulations to Tony and The Grandmaster . "Tony Fights Against Two 'Ka Fai' for Best Actor" - it sounds like the previous Hong Kong Film Awards . This time it should be Tony's turn since a Ka Fai won already . Good luck Tony, YOU ARE THE BEST ACTOR AS ALWAYS . The Hong Kong auteur's martial arts drama earns 11 nominations, while Cannes best screenplay winner "A Touch of Sin" from Jia Zhangke also makes a strong showing with six. Wong Kar Wai’s The Grandmaster dominates this year’s list of nominees for Taiwan’s Golden Horse Awards, which were announced today in Taipei. The Hong Kong auteur’s elegant work of martial arts hagiography earned 11 nominations, including Best Film, Best Director, Best Actor, Best Actress and Best Cinematography. Also making a strong showing is Chinese director Jia Zhangke’s A Touch of Sin, which played to acclaim at this year’s Cannes Film Festival, where it won the Best Screenplay Award. Jia’s multi-narrative meditation on the violence and dehumanizing undercurrents of China’s breakneck economic development earned six nominations, including Best Film, Best Director and Best Original Screenplay. Debut Singaporean director Anthony Chen’s Ilo Ilo -- a subtle domestic drama about a middle class Singaporean family who hire a Filipino maid to care for their son during the 1990s Asian Financial Crisis -- also nabbed six noms, including Best Director and Best Film. The film won the Camera d’Or at Cannes this year – a first for Singapore -- and is the city state's official nomination for the foreign language category at next year's Oscars. Three other titles earned six nominations: Feng Xiaogang’s famine epic, Back to 1942, Dante Lam’s MMA actioner, Unbeatable, and Stephen Chow’s Chinese box office smash hit Journey to the West: Conquering Demons. 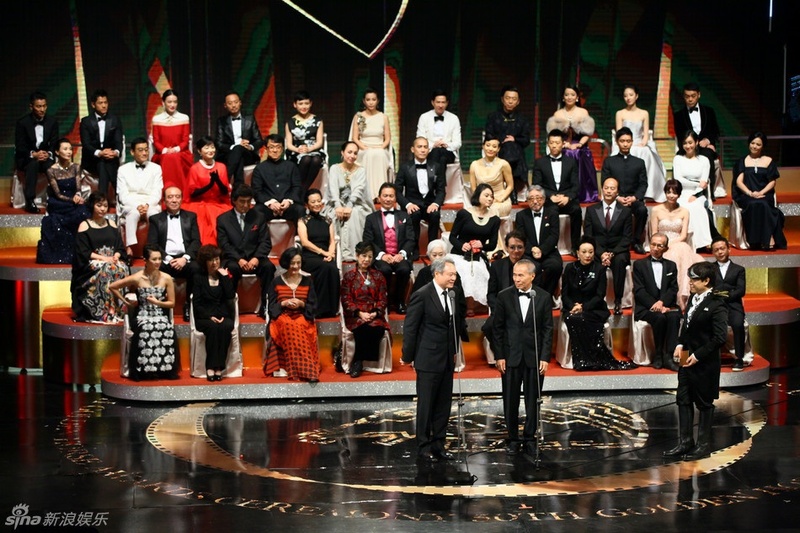 The Golden Horse Awards, celebrating its 50th anniversary this year, is one of the most established such events for Chinese language films. The awards ceremony will be held in Taipei on Nov. 23, with hometown hero Ang Lee presiding over this year’s jury as president. Japan-born Taiwanese screen legend Chen Chen will receive the event's lifetime achievement award. See below for the list of nominees in major categories. TAIPEI -- The Hong Kong-Chinese martial arts film “The Grandmaster” led the pack with 11 nominations for the 50th Golden Horse Awards Tuesday, including lead acting nods for Tony Leung Chiu Wai and Zhang Ziyi. The film, about the life of Yip Man, a late grandmaster of the martial art Wing Chun, also garnered nods for best feature film, best director, best cinematography, best visual effects, best art direction, best makeup and costume design, best action choreography, best film editing and best sound effects, the Taipei Golden Horse Film Festival Executive Committee announced Tuesday. In the best lead actor category, Hong Kong star Tony Leung Chiu Wai will compete with China's Jimmy Wang Yu, Hong Kong's Nick Cheung and Tony Leung Ka Fai, and Taiwan's Lee Kang Sheng. Chinese actress Zhang Ziyi, meanwhile, will be competing for best leading actress with Hong Kong's Cherry Ngan and Sammi Cheng, and Taiwan's Gwei Lun-mei and Shu Qi. Tying for the second-most nominations are the films “A Touch of Sin,” “Unbeatable” and “Journey to the West: Conquering the Demons” with six nods. In third place is “Stray Dogs,” which scored five nominations. The Golden Horse Awards Ceremony is scheduled for Nov. 23 in Taipei. Two-time Oscar-winning Taiwanese director Ang Lee is expected to head the jury in the awards, one of the most prestigious film awards in the Chinese-speaking world. Wong Kar Wai’s martial arts film picks up 11 nominations; A Touch of Sin and Ilo Ilo nominated in six categories apiece. Taiwan’s 50th Golden Horse Awards has announced its nominees with Wong Kar Wai’s The Grandmaster leading the race with 11 nominations including for best feature film and best director. Hong Kong’s entry to the upcoming Oscars best foreign-language film category, the martial arts film also scored nominations in categories including best leading actor for Tony Leung Chiu Wai, best leading actress for Zhang Ziyi and best cinematography for Philippe Le Sourd. Celebrating a half century of high-profile awards, Golden Horse covers entries from Taiwan, China, Hong Kong, and other Chinese speaking territories. With Ang Lee as president of the jury this year, the winners will be announced at a ceremony on Nov 23. The four other best feature film nominees are Jia Zhang-ke’s A Touch Of Sin, which picked up a total of six nominations including for best director, Anthony Chen’s Cannes Camera d’Or winner Ilo Ilo (Singapore’s Oscar submission) which also picked up six Golden Horse nominations including best new director, Tsai Ming Liang’s Stray Dogs with five nominations including best director and best leading actor for Lee Kang Sheng, and Johnnie To’s Drug War with four nominations including best director. The only best director nominee that didn’t make it into the best feature film category was Chung Mong-Hong’s Soul, Taiwan’s Oscar submission for best foreign-language picture category. The psychological thriller nevertheless picked up five nominations, including for best leading actor for veteran Jimmy Wang Yu of The One-Armed Swordsman fame. First big step very well managed ! Many thanks to Sandy and Jenny, for promptly informing us - in English also - about these pleasant news ! Congrats and best wishes to 'The Grandmaster' and to all the nominees for this film in their respective categories, especially to the grandmaster himself. It's time to educate the general public and to remind the academy who the best actor of them all is. You are absolutely right, Joe ! Love WKW's works! Particularly his sense of rhythm. BTW, that's a great picture!